RRTA has bike racks on our buses to help you get to where you need to go easier! Just ride your bike to the bus stop, put your bike on the bus and hop on board! The bike rack is located in the front of the bus. There is no charge for your bike, just pay your fare and enjoy the rest of your ride on the bus. Step 2 After lowering the rack, place the bike in one of the two bike rack wheel wells. Step 3 Pull the security arm over the bike’s wheels to keep bike secure. The security arm only touches the tires, reducing any potential damage to your bike. Step 4 Board the Bus! To unload the bike, just reverse the process. Each passenger is responsbile for placing their bike on the rack and taking the bike off when finished. When finished using the bike rack and no other bikes are in the rack, please place the bike rack in the upright, folded position. RRTA offers bike lockers at Queen Street Station. 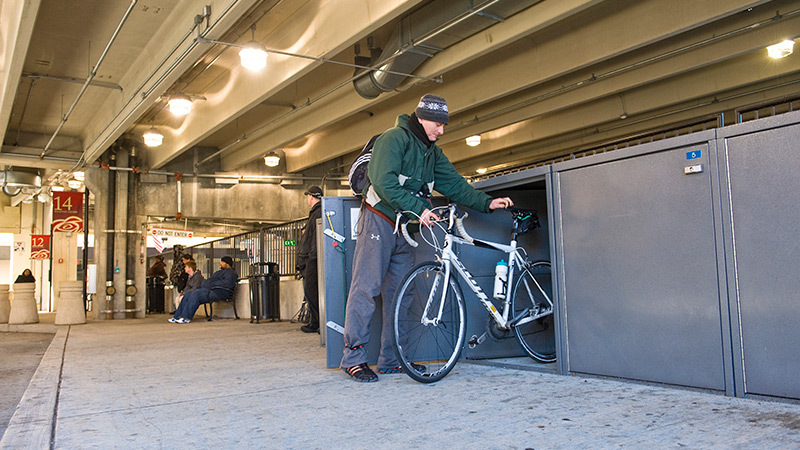 The bike lockers offer customers a secure, dry, storage area for their bicycle and bicycle equipment. The lockers are located at Queen Street Station near the Route 20/Greenfield bus stop underneath the parking garage building. There are six lockers available. Customers who are interested in using a locker must sign an agreement with RRTA. Any customer interested in using a locker should visit The Information Center at Queen Street Station to sign the agreement and receive their locker key. A $25 security deposit is required. There is no charge or rental fee for the locker.